Editor’s note: This post originally appeared on NextBillion Brasil. In 2010, two French students Christian Vanizette and Romain Raguin, traveled to Asia to meet social entrepreneurs. The students repeatedly asked them: What are your main challenges. Back in France, they continued their quest to discover root out key tests facing this cohort of social entrepreneurs, but this time they were also after the answers. That’s how they came up with MakeSense. MakeSense is an open project created to solve the challenges that social entrepreneurs face. On the site, entrepreneurs are invited to enter their daily trials and tribulations, and solicit remedies from users. In addition, the site organizes “hold-up” events, in which, for three hours, a “gangster” (that is, a member of MakeSense) leads a brainstorming session with 10 to 15 people to offer solutions for a particular entrepreneur’s challenge. The idea of MakeSense is not just to help entrepreneurs, but also to spread the concept of social entrepreneurship, by bringing together the challenges that these types of businesses face with those of regular people. This way, MakeSense has forged a true global community of people interested in the subject, many of whom, after taking part in a hold-up, actually wanted to join the project. Today, gangsters organize brainstorming sessions, bring forward ideas to improve the procedure for the meetings, and discuss the subject in a global group on Facebook. Gangsters, as well as anyone interested in the subject, also meet frequently for SenseDrinks, happy hours of social entrepreneurship that take place in different cities where MakeSense has presence. 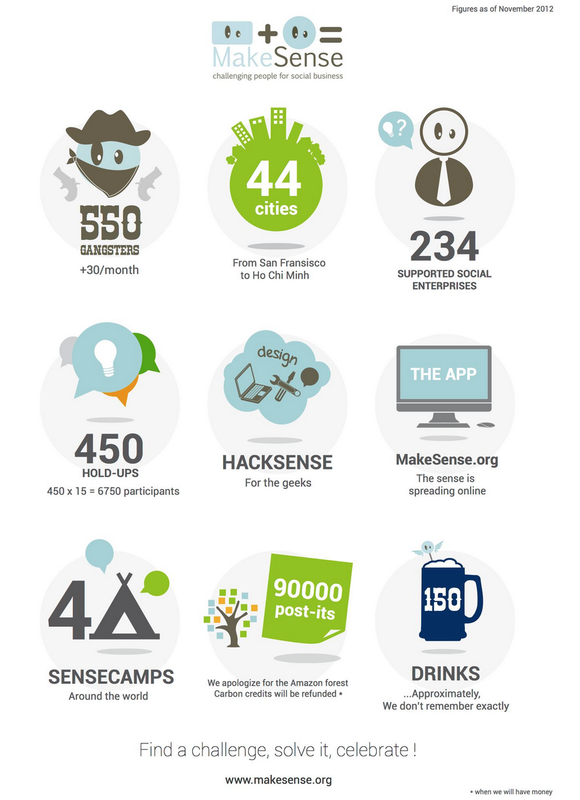 A little over two years since it was founded, MakeSense boasts close to 500 members, and is present in almost 30 countries, including cities like Paris, Berlin, London, Shanghai, and San Francisco. The objective is to mobilize, within the next two years, 300,000 people to solve those challenges, whether online (through the website) or offline (through hold-ups). MakeSense arrived in Sao Paulo in July, 2012. Already, hold-ups such as Atados, Projeto Pipa and 4you2 idiomas have been organized. Two of the members in Sao Paulo are Laís Paixão, who got acquainted with MakeSense while he lived in China, and Bruno Kawasaki, who actually got acquainted with the project in Brazil. “At MakeSense, we can find open-minded people, with a sense of community, willing to act to improve society, and always bringing innovation,” says a new MakeSense mBruno Kawasaki, who actually got acquainted with the project in Brazil.. In Brazil, as well as in most countries, MakeSense is no more than a project. All gangsters are volunteers. In France, some members fully dedicate to the cause and offer support to social businesses, which reinvest a portion of their profit to secure MakeSense’s sustainability. MakeSense supports three social businesses, SenseSchool, CommonsSense and UniShared. SenseSchool organizes programs and courses with universities for students to get acquainted with social entrepreneurship by solving the challenges that entrepreneurs face, and by learning via practical and innovative methods. The course already took place at Euromed Management, a business school in Marseilles, France. In that respect, CommonsSense helps companies create and mobilize innovating communities internally, e.g. via workshops. Orange and SFR, leaders of the telephony market in France, have already been served. At UniShared, site users can even write their class notes online in real time for others to see and comment. The idea is to generate a collaborative classroom in which everyone can take part, even those who are interested but are not actually in the classroom. These social businesses use MakeSense’s brand and network of contacts, which also contributes to spread the concept of social entrepreneurship in schools and businesses. “With MakeSense, I believe there is a good chance to be in contact with the sector, and to help it grow beyond Brazil, perhaps in the whole world,” states Laís. Image credit: MakeSense Facebook page.